You know this thing about Splash and Bubbles Games? Splash and Bubbles Games is a really interesting games category appeared on our site where you will get a lot of challenges so you you have to be ready for anything if you want to prove that you are worthy to get a place in the top of the best players in the world. I am sure you will love these games with your heroes from the PBS Kids animated series. In Splash and Bubbles Games you can find 2 games that we've published for these kids and childrens that are interested to play Splash and Bubbles Games, this game gategory have been created on 19.01.2017. These games with Splash and Bubbles Games have been voted 1 times and the avarage of vote is 5.00 stars. We advice you to play the last flash game from Splash and Bubbles Games, Finball Friends that have been published on 20.01.2017 02:03. Finball Friends its a part of Splash and Bubbles Games category and until now its played 874 times. Try it now on Cute-Games.com! 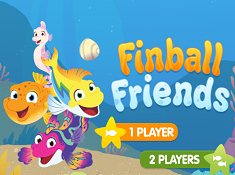 If your like the Finball Friends game you can write a comment in the game page. Recommend this game to your friends if you like it! 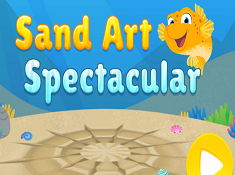 Sand Art Spectacular its a part of Splash and Bubbles Games category and until now its played 828 times. Try it now on Cute-Games.com! If your like the Sand Art Spectacular game you can write a comment in the game page. Recommend this game to your friends if you like it! Find More About Splash and Bubbles Games! This is an amazing category appeared on our site where we have a lot of surprises for you. We will try to bring you the newest games with your heroes from PBS Kids so I am sure you will appreciate our effort to give you something to play everyday. The Splash and Bubbles Games category is going to be on your taste, I am sure of that, because here you will have a lot of challenges with your favorite heroes from PBs Kids. This new animated series appeared in November 2016 is going to present the adventures underwater of some friends: fish, sea horses, sea stars and so on many other sea animals. In this cute category called Splash and Bubbles Games you can meet all the heroes from cartoons and new ones and you have to do your best to complete your tasks step by step. Your skills will be tested. In some games you need agility, ability, maybe precision, in other games you need attention, creativity, maybe patience. I am sure you can handle the challenges but you have a lot of work to do so be careful and try to overcome your record every time in order to maintain your place in the top of the best players in the world if you succeeded to enter. In these Splash and Bubbles Games category everyday we will have a new game for you with your heroes so I am sure you will enjoy coming on our site. Give us a like if you enjoyed the Splash and Bubbles Games category and tell us in one comment what do you think about our site, which is your favorite game and if you want more categories like this one here on cute-games.com, the best games site in the country. I think you can make a great job in this Splash and Bubbles Games only if you focus and if you have persistence. For example if you try a challenge and you can not complete your goal from the first attempt it will be a big mistake to give up. I suggest you to try again, to learn from your mistakes and in this way you will successfully complete your goal. In this Splash and Bubbles Games category you have also a nice creativity game where you will create some art in the sand with our heroes from cartoons. You can make drawings in the sand, you can add some colorful stones and so on in order to create something amazing. If you like the final result, if you are proud of the sand art that you have just created you can save it in your computer or print it. You can show the sand art yo your friends and family to show them that you are creative. IF you think you could do better try again to make a beautiful sand art and I am sure you can make a great job. If you have not heard about this series by now we will tell you a few information about it. Splash and Bubbles is a new animated series from PBS where are presented the adventures of two fish and their friends. The main characters are Splash and Bubbles who befriend Dunck and Ripple. In every episode they have a new adventure and they learn a lot of interesting things and make new friends. In every episode is a part where the kids are asking questions and our heroes answer. In this way all the kids, girls and boys have the chance to learn more about sea life. The heroes live in Reeftown with a lot of sea animals. Splash has been looking for a home all his life and traveled all over the ocean but he finds it here in Reeftown. Bubbles is messy all the time. He gets in trouble pretty often and Splash has to save them from problems. If you want to help us promote this category you can give us a g plus. Dunk can make art from sand, with him you will play the creativity game offered by our site. He is an intellectual and the funny fish from the group. Ripple is a seahorse and she lives with 499 brothers and sisters. I think you will enjoy this cute category and we are happy to see that you will have a good time here on our site. There are a lot of challenges here so you have to do your best to complete them. Do your best to earn a big score if you want the chance to reach the podium where are only the best of the best. Try again if you can not make it from the first attempt because at any game you will become better and better with training. This category is appeared in exclusivity on our site so I am sure you will appreciate our effort to bring you always first the newest games inspired from movie, cartoons, series and animated series.